Cape gooseberries simply appeared in my garden and then proceeded to take over! I think the original seeds popped out of the compost from the gooseberries my father shared from his garden. They are at their best when the fruit turns an orangey yellow. The delicate papery shells have gone on to become part of head dresses and necklaces for dolls. Grease or line your baking dish with baking paper. Add eggs, cream icing sugar and salt to your bowl. Whisk until well combined, sift in flour [or add ground almonds] and gently whisk in so that there are no lumps. Pour batter into baking dish. 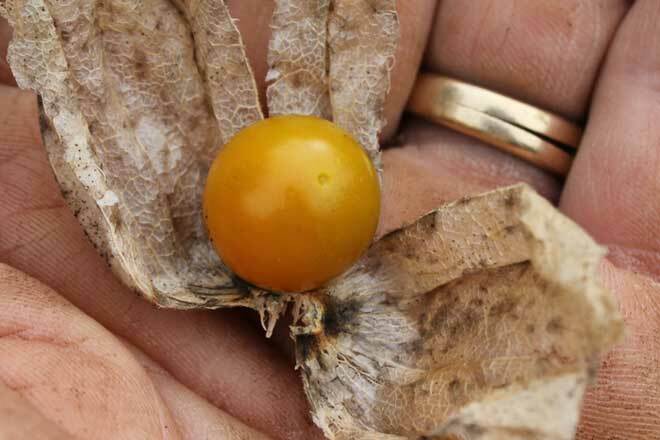 Dot with cape gooseberries. Bake 30 to 40 minutes or until golden and set. Any fruit will work, but combinations of tart fruit and the and sweet are particularly good...raspberries, tamarillos, cranberry.